Discovering the past from clues: Old leather wallet in the SFA library. It was found with a torn page from HRS book, part of page 52 in Henry Reed Stiles’s Book on the CT family, in the inside of the Wallet. 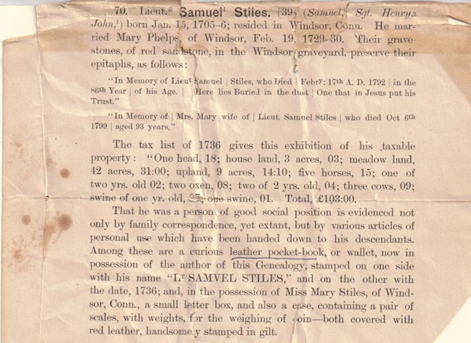 Mr. Samuel Stiles is embossed on one side and 1737 on the other as can be seen above. From the description above, we conclude there were two wallets that are very similar and as we see below probably were purchased by the same person. The one referred to above belonged to Lt. Samuel, Jr. Born 1705-6. 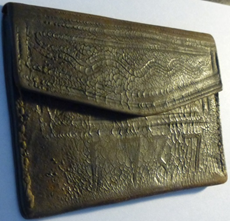 His wallet has Lt. Samuel Stiles embossed on one side and 1736 on the other. 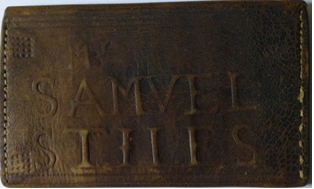 He had a son Samuel, III, his namesake, baptized May 15, 1737 Died 1757 at age 20. Info from HRS pg. 53. The one in the SFA collection must be the latter’s. We don’t know where the other one is now. The information in HRS notes above indicate that Henry Reed Stiles had it at the time of the printing of his book.